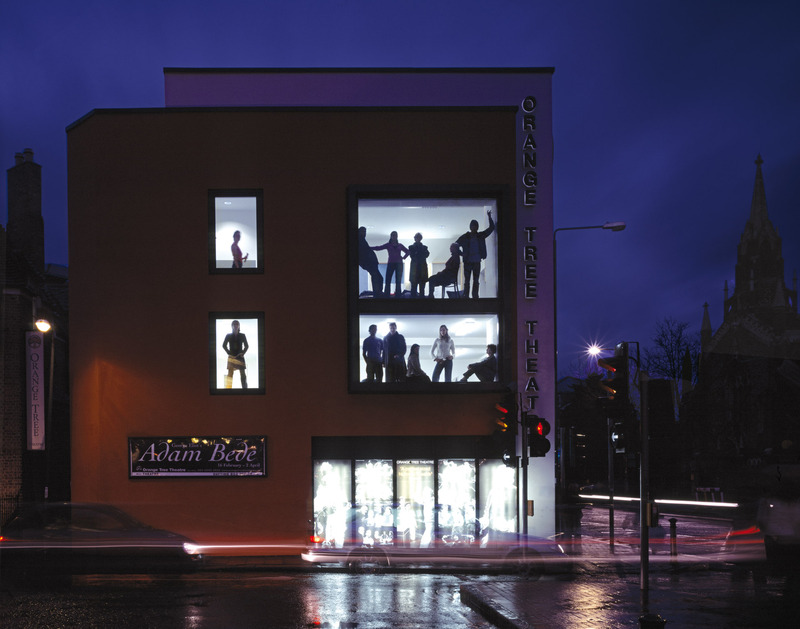 Keith Williams’ second project for the Orange Tree Theatre, and the one that was eventually realised involved the retention and remodelling of No. 47 Kew Road to create simple additional backstage facilities. The brief and the site in combination created a certain paradox in that the Orange Tree’s most prominently sited building would house primarily backstage facilities more normally out of sight of its audience. In this apparent paradox lay the opportunity. Internally, the remodelled building has created new space for rehearsal, wardrobe, design studio, theatrical workshop and storage space. Williams used the opportunity to step beyond the project’s simple internal programme to create a striking landmark in the townscape with the remodelled building acting as a form of billboard, signalling the presence of the Orange Tree Theatre more widely in the locale. In urban terms the remodelled Rehearsal Building (47 Kew Road), and the Orange Tree pub opposite, form a pair of unequal gateway buildings of very different architectural styles marking the emergence of Clarence Street onto Kew Road. The existing building’s parapets were raised in height and sculpted to achieve an interlocking of form to aid the architectural articulation of the corner building. To establish a contextual link, the broad colour palate of the red brick and pale cream of the stone from the Orange Tree pub was lifted and deployed across the rendered surfaces of the remodelled building to reinforce its new form and detail. At street level the building surfaces become a large illuminated poster site allowing current and future shows to be publicised. The remodelled building is at one and the same time contextually derived yet makes a simple bold statement of powerful painterly planes of surface composition. The project has re-ordered a mundane building on an important site, and announced the Orange Tree’s physical presence in the townscape far more directly whilst at one and the same time making a significant contribution to the mature urban scene.